Have the leading figures in the Lean community walked the “Respect for People” talk? Not in my view. Most of these leaders have only recently – around 2007 or later – begun to understand and embrace the “Respect for People” principle. That is incredibly late. While there are many dimensions to the “Respect for People” principle, the one that is superordinate in the minds of employees is: “Are you going to lay me off as a result of continuous improvement?” Not much else matters if you don’t have a job. So, the question is, have the leading figures in the Lean community been sufficiently vocal in their opposition of companies (and leaders) who lay employees off as a result of continuous improvement? Doing so is, obviously, the ultimate in disrespect to employees. Have the leading Lean figures visibly, vociferously, on the record, consistently, and repeatedly stood against this type of human abuse and suffering? By my estimation, they have been largely silent. 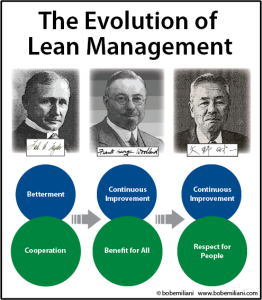 Frederick Winslow Taylor (USA), Frank George Woollard (UK), Taiichi Ohno (Japan) and their management principles. Why? Perhaps they were too focused on Lean tools? Maybe they did not recognize, did not understand, or ignored the “Respect for People” principle, despite it being a bedrock principle of progressive management practice for more than 100 years? Is “Respect for People” embraced now because it is something new that can be packaged and sold as the next Lean tool. Whatever has been done by leaders of the Lean movement to denounce Fake Lean has not been nearly enough. There is a long, long history of managers laying off workers as a result of continuous improvement. This is not a secret. It is the normal outcome. Over the last 25 years, Fake Lean has likely displaced a million or so workers in the United States, and more globally. That’s not the reward employees expect for their hard work. 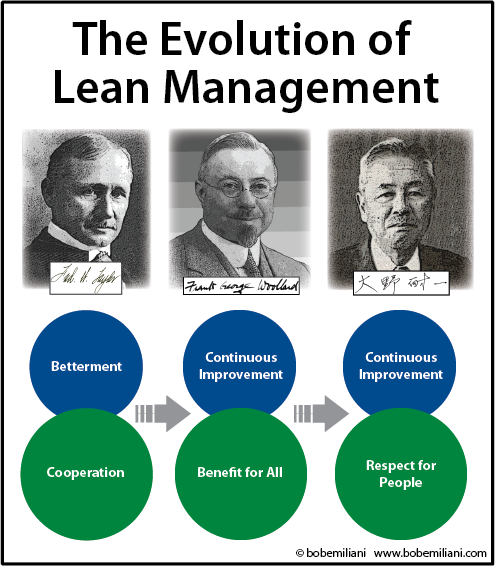 The inability of the leading figures in the Lean community to powerfully support this fundamental improvement over conventional management, from the very start, is pitiful. Being leaders of a movement requires acceptance of the good with the bad. No movement consists solely of upside. There are downsides that must be quickly acknowledged and vigorously responded to, even if the harm is done by others. Within that lay moral ambiguity and ethical dilemmas that must be handled responsibly and not ignored. Denial of one’s responsibility for the purpose of avoiding painful truths is not leadership. Yet, leaders of the Lean movement preferred to look the other way, hoping that those responsible for hiring and firing would someday recognize, on their own, that laying people off due to Lean stops continuous improvement. Some have, but most have not. I cannot follow anyone who is not solidly behind the idea that Lean must do no harm. It is noteworthy that some people in the second tier of the Lean movement are far more committed to this than the leading figures who occupy the first tier. Bravo! Apparently, their minds were open to many other sources of influence. And, perhaps they have been closer to the problem, as I have, and seen firsthand how people have been affected by Fake Lean. Lean, done right, helps eliminate human suffering and improve the human condition, especially for employees. Yet, promoting Lean while being silent about the negative effects that Fake Lean has on employees is incongruous and clearly self-serving. Is Lean itself, and the stature of those who lead the movement, more important than people? Definitely not. Thinking that it is diminishes both Lean and stature of the movement’s leaders. The latter, rightly so. The leading Lean figures, including those who lead non-profits, have made millions of dollars in income by promoting Lean. Financially, they feel no pain. Their income has been steady and uninterrupted. Nice for them. Connecticut has a great manufacturing history. A few Connecticut manufacturers were among the first in the United States to adopt Lean, REAL Lean, taught to them by Shingijutsu kaizen consultants. Over time, the practice weakened among these exemplars due to changes in management and Fake Lean became more prominent. Some Connecticut businesses, widely praised for their Lean efforts, have actually been Fake Lean shops from the start, as are most organizations. The consistent result of continuous improvement has been continuous layoffs. That is wrong. Layoffs have serious consequences. But, the leading figures in the Lean community looked the other way instead of confronting this problem head-on, apparently thinking that some improvement is better than no improvement – that the advancement of Lean is of greater importance than the harm done to employees. Sometimes, getting laid off is a blessing in disguise. It gives some workers a reason to pursue a different career, one that better fits their interest and capabilities. But, that is the exception and not the rule. What I have seen apparently is not the same as what the leading figures of the Lean movement see. Likewise, my students, full-time working professionals, don’t see what the leaders of the Lean movement see. Instead, they see a huge gap between how Lean must be practiced – how Toyota practices Lean – and how the leaders of their company practice Lean. They are not comparing their actual situation to a theoretical ideal. They are comparing their situation to Toyota and similar examples of real-world organizations that practice Lean well. I challenge the leaders of the Lean Enterprise Institute, The Lean Enterprise Academy, Lean Global Network, Planet Lean, Shingo Institute, Association for Manufacturing Excellence, Society for Manufacturing Engineers, Center for Healthcare Value, Lean Education Academic Network, and all similar organizations in the United States and elsewhere to adopt this policy in its entirety and without modification. The next step is to walk the “Respect for People” talk: Bring the policy to life through concrete actions by the leaders, employees, members, and customers of these organizations. I hope you will join me in challenging the leaders of these organizations to adopt this policy statement. And, feel free to adopt it as your personal or business policy for your Lean efforts.